Saskatoons are large, deciduous, native shrubs in the Rosaceae (Rose) family. 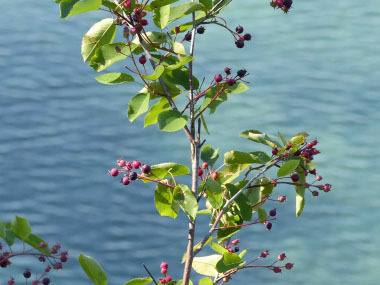 Saskatoon berries have a variety of names throughout North America which include: serviceberry, shadbush, juneberry and prairie berry. The Saskatoon name is reportedly an anglicization from the Cree language word misâskwatômina (Mis-sack-qua-too-mina), which means “the fruit of the tree of many branches”. 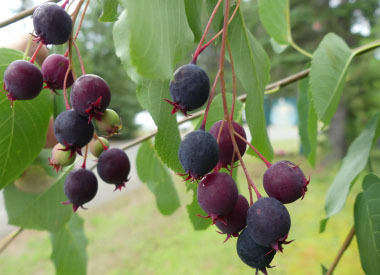 Although they look a bit like blueberries, Saskatoons are more closely related to the apple family. Like their apple cousins, Saskatoons continue to ripen after they are picked. 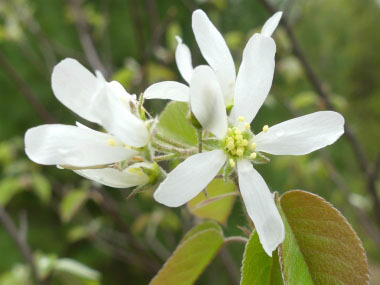 There are different species of Amelanchier with the most popular being the Amelanchier canadensis in eastern Canada and the U.S.
Trunk/bark: Saskatoon has a smooth,grey trunk. Trunks are ash-gray with dark stripes when young, and rough, with long furrows when older. 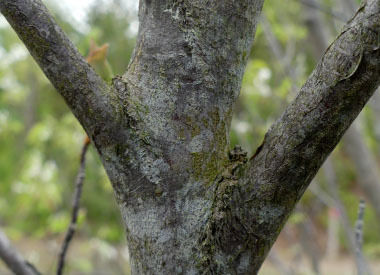 Branches/twigs: Its branches slope upward so as to be almost parallel with the main stem. The twigs are hairy when young, becoming smooth with age. 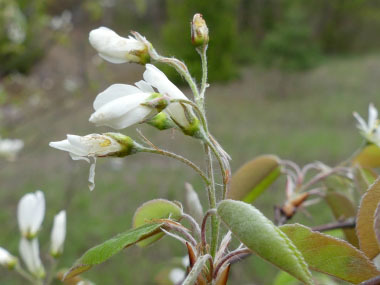 They are reddish-brown in the winter and produce reddish-purple leaf buds. 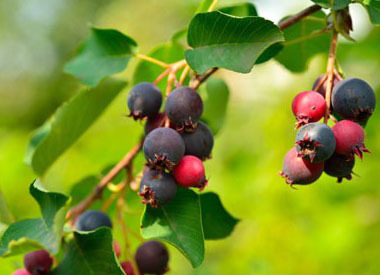 Height: Saskatoons grow to almost 5 metres (16') tall and bush out to about 3 metres (9'). 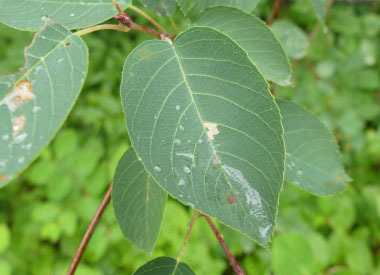 Leaves: The 3 to 6 cm long and 2 to 3 cm wide deciduous leaves are oblong, finely-toothed, rounded at base, and rounded at the apex with a small, sharp projection. There are 10 to 15 pairs of main veins. 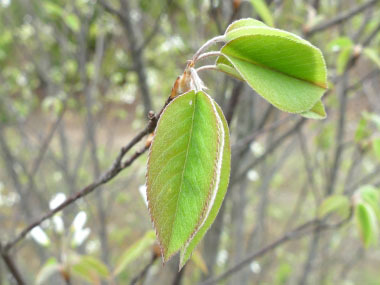 The young leaves are covered with a soft, fine hair and will become dark green and smooth with age. Fruit: The fruits are about 1.5 cm (.5”) in diameter with 2 to 5 very small seeds in the pear or apple-like core. They resemble wild blueberries in size and shape. Berries ripen in late June or early July. Depending on location and conditions they can persist into late July. 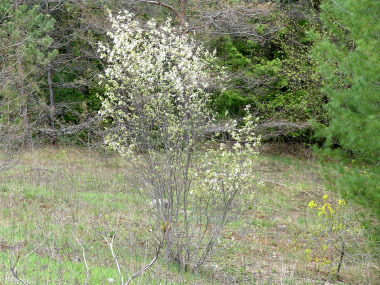 Habitat: Although Saskatoons are largely forgiving of soil conditions, they seem to prefer sandy loam. They do not do well in poorly drained or heavy clay soils. They do best in pH values between 5.5-7.0, but are known to grow in a much broader pH spectrum. They can be found in swamps, along roadsides, in woods and in thickets. They also grow along the banks of streams and on hillsides. Although native to Canada and the U.S., these have naturalized in some European countries including the UK. 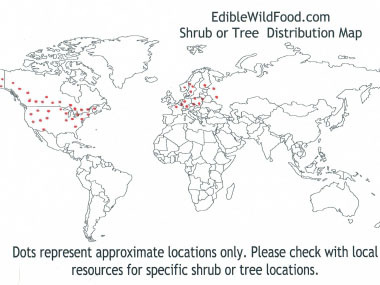 They are also cultivated in North American and Europe as they are nutrient-dense berries. Edible parts: The berries are a sought-after annual treat. They are high in many nutrients as well as fibre, protein and antioxidants. Fully mature berries are sweet and have a desirable full fruit flavour.